"So Katie, I've been reading your blog lately, and I've got to say, you've had a lot of food and wine lately, not so much Mod Podge. What's with that?" I confess, you're right. My Mod Podge love has been a little absent lately, and it should be a bigger part of this blog. However, Mod Podge is not the only crafty medium I use, so I think the MP part of this blog will have to include all crafty projects. Amazing tutorial !! Thank you for sharing. I'm going to try this. 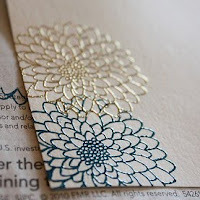 Thanks for the tutorial...can you tell me name of flower stamp you used? I would love to find one.